You're able to set up tracking and analytics so that you can get more information about the activity on your campaigns and donation pages. Currently, we allow you to install tracking codes from Google Analytics, Hubspot, and Facebook Pixel. Note: Hubspot and Facebook Pixel are only available on the Plus and Premium plan. Step 1: Login to your account and navigate to your Fundraising. Step 2: Select a campaign or donation page that you want to embed tracking on. 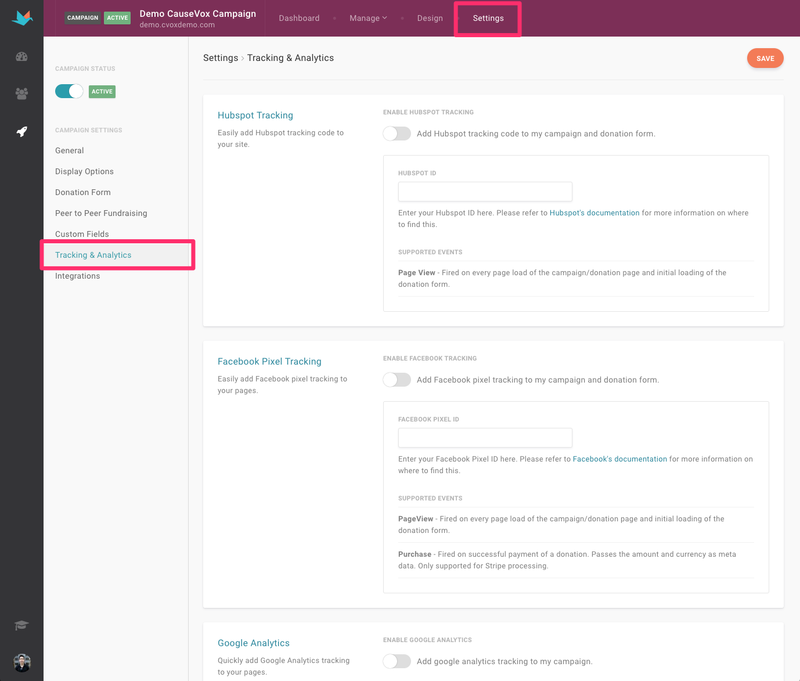 Step 3: Go to your Settings and click on Tracking and Analytics on the left menu. For Hubspot: Enter in your Hubspot ID to start tracking campaign and donation page views. For Facebook Pixel: Enter in the pixel id to start tracking page views as well as the number of successful payments completed (for Stripe users only). For Google Analytics: Enter in your tracking ID to track pages views. Step 4: Save and you're all set to start tracking activity on your campaign site or donation page.